Did you know that each household in the UK throws away approximately £470 worth of food a year? That amounts to 7 million tonnes of food and drink that is wasted, the majority of which could have been safely consumed. The majority of food thrown away is because there was too much prepared or it was forgotten about and expired. The Waste and Resources Action Programme (Wrap) suggest that a new blue fridge logo should be added to food packs to signify to a consumer whether the product needs to be kept chilled or not. For example apples, oranges and pears should be kept in the fridge to extend their shelf life, but other fruit perhaps not. Here at ETI we specialise in temperature monitoring, including correct fridge temperatures. The best way to store your perishable foods is to keep them in the original pack and store in a fridge where the temperature is kept below 5°C. By doing this, the expiration date for most foods should increase by three days. Wrap said: ‘Only one third of UK fridges are set within the recommended temperature range, below 5°C, and another third operate above 9°C. It said the measure, combined with others to simplify food labels, could cut food waste by 350,000 tonnes a year by 2025, saving consumers £1 billion. 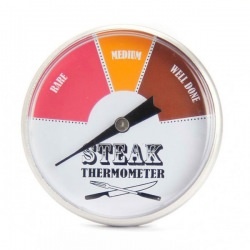 Keeping your fridge to the correct temperature is easy when you have a handy fridge thermometer. Our Fridge Freezer thermometer with 70mm dial is housed in an ABS case with a temperature range of -30 to 30°C. It can be used in the fridge or freezer and can be hung or free-standing. By spending just £3.42 on a fridge thermometer you could save your household up to £470 in food waste each year. ThermaGuard Fridge Thermometers – New for 2017, these high accuracy fridge or freezer thermometers feature a large LCD display, which simultaneously displays the current and max/min recorded temperatures. The ThermaGuard measures temperature over the range of -39.9 to 49.9 °C (external sensor) with 0.1 °C/°F (switchable) with an accuracy of ±0.4 °C. Both models feature programmable audible alarms allowing the user to preset high and low temperature limits. When the alarm is active the LCD will flash. The alarm can be silenced by pressing any button. Each ThermaGuard is housed in a splashproof IP54, ABS case which includes the ‘Biomaster’ additive that reduces bacterial growth, ideal for monitoring chilled and frozen foods. An optional two-point (-18, 0°C) UKAS Certificate of Calibration is available. Each certificate indicates deviations from standards at -18 and 0 °C. *UKAS certificate applies to remote probes only. Wraps new guidance also includes reducing the number of date labels on products to reduce confusion. They stated that a ‘use by’ date need only be printed where safety is an issue, for example, fresh meat, fish and poultry, fresh pasta, chilled ready meals, cooked sliced meats, pâtés, cut fruit, and sandwiches. However for other products a ‘best before’ date should be given as a guide and the consumer should be able to decide whether it is still consumable after that date. Many foods are still safe to consumer after their ‘best before’ date, these products could be redistributed to charities and food banks – reducing food waste significantly. Wrap also recommends clear advice on packs as to how a product should be stored once opened and how long it will last. It said: ‘We estimate that technical changes to packaging and labeling could help cut around 350,000 tonnes of household food waste a year by 2025, saving shoppers around £1 billion a year in wasted food.